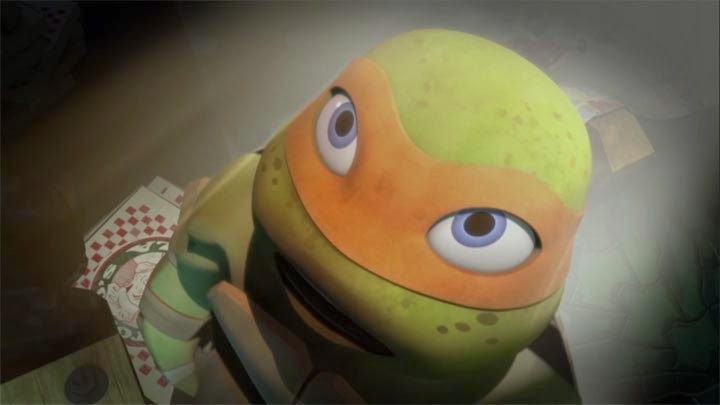 Nickelodeon has been doing a tremendous job with the Teenage Mutant Ninja Turtles show. In this early web-release episode, "Into Dimension X," we get some really good stuff. Simple changes are hugely meaningful in giving us a change of perspective. First off, we get the return of both Super Robo Mecha Force Five Team 5 (The series finale on VHS) and Leatherhead, who has been lost in Dimension X for quite some time. Leatherhead sends a warning to the Turtles about the Kraang perfecting the mutagen and a dire need to stop whatever nefarious plans they've cooked up. 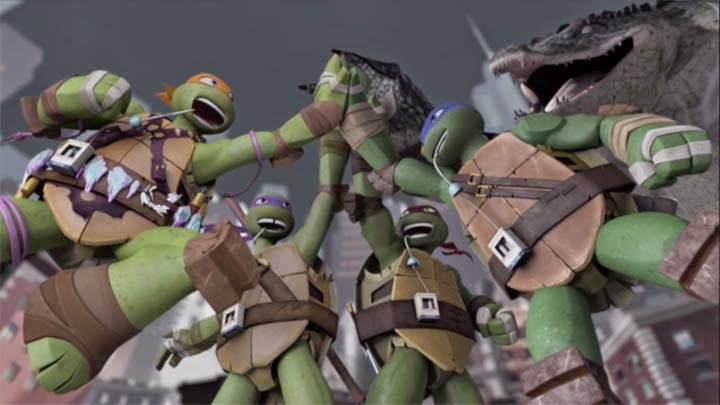 After deciding to help, Donatello and Leonardo tell Mikey that he can't come because he'll screw things up. Mikey being the great rebel takes it upon himself to jump through the portal to save his buddy Leatherhead ahead of everyone. The rest of the Turtles stunned at the occurrence follow through shortly after. Anyone else recognize a small homage to the TMNT: Turtles in Time with the portal's tunnel? Once the Turtles make it to Dimension X and find out that no matter how cute things appear they could be deadly. Time passes at a different rate and gravity doesn't work right either. Nothing here is how it seems. They eventually catch up to Mikey who is a very smart guy with all the differences between their dimensions. He has somehow learned a huge amount of things and is a greatly capable individual. Being a borderline genius here he winds up taking lead and dispatching enemies with ease. In addition to saving the day in general by thwarting the Kraang's plot- he has a few notable changes while in Dimension X. The most visible is his helmet- he is wearing a Kraang skull for a hat. Quite morbid, but very entertaining- I never really thought they'd have skeletons. Then he has one of their limbs as an armband, and uses fart-noise-making worms as grappling hooks that never lose their hilarity. In Dimension X Michelangelo is a Batman, and it is wonderful. As I am trying to not spoil the entire episode, I believe this is another episode that makes important changes in a way that is funny and meaningful. One thing that has me thinking is Splinter's staff from older episodes looks an awful lot like the the giant one Leatherhead is hauling around... could there be a link? I think there could be. Anyways, this "Into Dimension X" episode was a nice little jaunt into Kraang territory and I hope to see more of it in the future.